This article is about the NES accessory and the in-game character based on it. For other uses of the name Rob, see Rob (disambiguation). "Robot" redirects here. For information about Mechakoopas that were called "Robots" in the Super Mario World television series, see Mechakoopa § Super Mario World cartoon. For robots in the Mario franchise, see Category:Robots. R.O.B. (short for Robotic Operating Buddy; in Japan known as the Famicom Robot, short for Family Computer Robot, or simply called Robot) is an accessory released alongside the Nintendo Entertainment System to help advertise the console as a toy. He functions by translating flashes of information on the television screen into physical actions to assist players in compatible games, and was only used for the games Gyromite and Stack-Up. While R.O.B. has made cameo appearances in the Mario franchise, he has also appeared as a playable character, most notably in Mario Kart DS. R.O.B. 's artwork from Mario Kart DS. R.O.B. is one of the four unlockable characters in Mario Kart DS, unlocked by winning either all nitro Mirror cups, or all retro Mirror cups, and is the first non-Mario character to appear as a playable character in a Mario Kart game. In the game, he is tied with Bowser for being the heaviest racer. R.O.B. 's symbol is the NES D-pad. R.O.B. has two original karts: the ROB-BLS, which resembles R.O.B. 's stand for the game Stack-Up, and the ROB-LGS, which is a kart that appears like "legs" for R.O.B. His karts are fast, heavy, and have stronger handling, but they also offer the weakest drifting among all the other karts. R.O.B. is the only character in Mario Kart DS who doesn't control his kart with the wheel; instead, he seems to control the kart by moving his arms. In the Japanese version of the game, R.O.B. 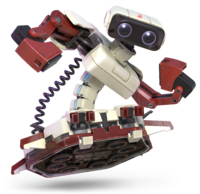 is colored like his Japanese model, and is named HVC-012, the model number for the Japanese version of R.O.B. His karts have also different colors in the Japanese version. Also, the staff ghost data for Desert Hills and Rainbow Road feature the Japanese R.O.B. and vehicles, no matter what version of the game the player has. This marks R.O.B. 's first and only physical appearance so far in the Mario Kart series, making him the only playable character in Mario Kart DS to not return as a playable character in later installments. R.O.B. as a boss in WarioWare: Smooth Moves. R.O.B. is the subject of the Stack-Up microgame in WarioWare, Inc.: Mega Microgame$! from 9-Volt's games. In WarioWare: Twisted!, a R.O.B. is seen in 9-Volt's game room. In WarioWare: Touched!, a R.O.B. accessory appears in the microgame Gunslinger after the player destroys a blue canister (this microgame is found in 9-Volt/18-Volt's stage). In WarioWare: Smooth Moves, R.O.B. is the boss of 9-Volt's stage, the Star Fox boss level. Like many of his other appearances, his model differs between Japanese and western versions. 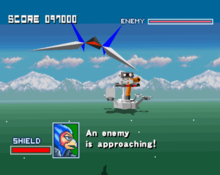 He bobs around, shooting either a large revolver-like light gun using both arms in the Japanese version or its western equivalent, the NES Zapper. To defeat him, the player has to shoot the flashing blocks set-up for has if he is being used to play Stack-Up. R.O.B. reappears in WarioWare Gold, appearing in the R.O.B. Block Set microgame. R.O.B. appears as a newcomer and unlockable playable character in Super Smash Bros. Brawl. He is unlocked by playing 160 Brawl matches, collecting 250 trophies, or having R.O.B. join the party in The Subspace Emissary. His moveset is mostly based on the original R.O.B. accessory. His standard special move is Robo Beam, which fires a beam from between R.O.B. 's eyes. R.O.B. 's side special move is Arm Rotor, which has him spin his arms around rapidly to attack. His down special move is Gyro, which charges and tosses one of R.O.B. 's gyro accessories. His up special move is Robo Burner, which uses jets in R.O.B. 's base to fly into the air. 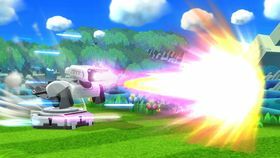 His Final Smash is Diffusion Beam, which fires a short-range constant beam from R.O.B. 's eyes that deals constant damage to nearby opponents. R.O.B. 's general appearance in the game is that of the Japanese version of the accessory, while his NES colors appear as an alternate costume. Also, one of R.O.B. 's alternate costumes is based on the colors of the North American SNES. In addition, a structure that looks similar to R.O.B. appears in the Port Town Aero Dive stage, as he is in F-Zero GX. He is visible in one of the stop spots in the background of the stage. Before the events of the Subspace Emissary, R.O.B. was the leader of the R.O.B. race of robots, officially titled the Master Robot. He and the other robots lived on the floating Isle of Ancients and watched over the World of Trophies. However, it was ultimately invaded by Tabuu, a humanoid entity from Subspace. He attacked the Isle of Ancients, deactivating many R.O.B.s and eventually taking the robots hostage. R.O.B. was forced to ally himself with Tabuu in order to prevent the deaths of more of his robot brethren, and began to hide under his ceremonial robes of mourning and assume the title of Ancient Minister. The Isle of Ancients itself was converted into The Subspace Bomb Factory, and the Ancient Minister became the commander of the Subspace Army. As the commander of the army, he lead the invasion of the World of Trophies on behalf of Tabuu, while a specially trained group of R.O.B.s served as the "Ancient Minister's" personal bodyguards, the R.O.B. Squad, made up of R.O.B. Sentries, R.O.B. Launchers, and R.O.B. Blasters. R.O.B.s were also used to detonate Subspace Bombs, to the "Minister's" deepening regret. As the Ancient Minister, he first appeared in the Subspace Emissary after Mario and Kirby's match at the Midair Stadium, where he detonated a Subspace Bomb, sending the stadium to Subspace. He escaped, only to be later chased by Mario and Pit in The Plains, who had little success catching him. He then detonated another Subspace Bomb at The Battlefield Fortress, attracting the attention of Marth, Meta Knight, and Ike. Regardless of the group's efforts, he manages to escape their grasp, however, he is soon discovered by Mario and Pit once again, along with Link and Yoshi. Again, the Ancient Minister escapes, but not before detonating yet another Subspace Bomb, sending King Dedede's Castle into Subspace. The Ancient Minister is not seen again until Samus Aran and Pikachu corner him at the Subspace Bomb Factory. Samus and Pikachu are ready to fight, but the Ancient Minister refuses, growing depressed at the number of R.O.B.s sacrificed to activate the Subspace Bombs, confusing them. Soon after, Donkey Kong, Diddy Kong, Captain Falcon, and Captain Olimar arrive, also battle-ready, but the Ancient Minister still refuses. A holographic Ganondorf appears, quickly realizing that he has betrayed him. 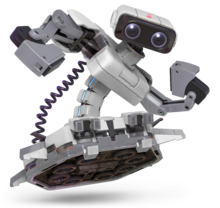 Using a remote-controlled button, he is able to control the R.O.B.s, ordering them to attack the Ancient Minister and activate every Subspace Bomb in the factory. The Ancient Minister's true form: R.O.B. However, when the R.O.B. Squad shoots the Ancient Minister, his robes burn off, revealing to everyone present that he was a R.O.B. himself all along. Unable to prevent the bombs from being detonated, he ends up finally being carried away by Donkey Kong as the factory explodes. R.O.B. escapes with the others on the Falcon Flyer and later meets up with the rest of the characters on the ground. He and the rest of the cast go into Subspace to confront Tabuu, but are all turned into Trophies. Eventually, Kirby saves him and he joins the group who go on to defeat Tabuu and save the World of Trophies. With so many Subspace Bombs set off simultaneously on the Isle of Ancients, only a shining, X-shaped scar appears where the Isle once was when the rest of the world is restored with the destruction of Tabuu and the Great Maze. Enemy R.O.B.s in The Subspace Emissary. R.O.B. 's NES version appearance in Super Smash Bros. for Nintendo 3DS / Wii U.
R.O.B. appears again in Super Smash Bros. for Nintendo 3DS and Super Smash Bros. for Wii U as an unlockable character. This time around, his default palette is different depending on the version to match the colors of his original release; in the Japanese version, he is the tan and red Famicom palette, while the US and PAL versions have the grey NES palette. R.O.B. also has a new Final Smash, the Super Diffusion Beam, which turns R.O.B. into a cannon that fires a single beam, dealing continuous damage until the end of the attack. For equipment, R.O.B. uses the Zapper equipment for attack, the Block equipment for defense, and the Booster equipment for speed. R.O.B. 's Famicom version appearance in Super Smash Bros. Ultimate. R.O.B. reappears as an unlockable playable character in Super Smash Bros. Ultimate. This time, he has a light gauge on his chassis showing how much fuel he has left when using his Robo Burner, which emits blue when it is full, yellow when it is two-thirds full, red when it is one-third full, and flashes red when it is completely empty. R.O.B. 's pummel now has him headbutt the opponent, while his forward throw now has him rear his arm back, and punch the opponent. R.O.B. travels higher during his up throw, while his down throw now buries opponents; it deals less damage to compensate. Once again, R.O.B. 's Final Smash has been changed. His double jumping animation is now a midair twirl. R.O.B. is not seen when the fighters oppose Galeem for the first time. However, he, like every fighter except Kirby, is hit by one of Galeem's beams of light and imprisoned in the World of Light, where a puppet fighter of him is created. Said puppet fighter initially serves Galeem, but is later forced into serving Dharkon. Kirby's team defeat the Dharkon-serving R.O.B. puppet fighter in the Dark Realm, freeing the real R.O.B. who joins the team against Galeem and Dharkon. Meta Knight Halberd Pink Ball Activate! Robo Beam is R.O.B. 's standard special move. When used, R.O.B. fires a laser beam from his eyes that travels through opponents. The shot can be angled up or down with the control stick and reflect off of the floors or walls, and using the beam closer to opponents causes them fire damage. Firing again right after firing once causes the beam to be a close-range attack. Holding the Robo Beam for a period of time turns the shot into the Super Robo Beam, a larger and more powerful shot that travels across the entire stage. The levels of charge are determined by the LED on R.O.B. 's head; he glows brighter and blinks faster when the normal Robo Beam can be used, and he glows and blinks even more, in addition to a sound playing, when the Super Robo Beam is available. In Super Smash Bros. for Nintendo 3DS / Wii U, Robo Beam has two customizable variations that can be unlocked and switched out. The first custom move is Wide-Angle Beam, which allows R.O.B. to fire a less-powerful beam at wider angles. The second is Infinite Robo Beam, which allows R.O.B. to fire the standard Robo Beam at any point, but it takes longer to charge the Super Robo Beam, the attack itself is weaker, and the laser can no longer bounce off walls. Arm Rotor is R.O.B. 's side special move. R.O.B. spins his arms around at a downward angle as he moves forward, dealing multiple hits to any opponents in his path; in Super Smash Bros. for Nintendo 3DS / Wii U, the move ends with an uppercut that deals greater damage and knockback. Players can move in the opposite direction while the move is in use. The move also lasts longer if the player holds down the special move button, and can reflect projectiles. Two custom variants for Arm Rotor are also available in Super Smash Bros. for Nintendo 3DS / Wii U. The first is Reflector Arm, which makes it easier to reflect projectiles as R.O.B. 's arms spin completely horizontally rather than at an angle, but R.O.B. can no longer move during the attack. The second is Backward Arm Rotor, which has a shorter spin but allows the uppercut to happen more quickly. Robo Burner is R.O.B. 's up special move. When used, R.O.B. flies into the air using the jets under his base. Unlike other up special moves, this move can be stopped at any point and does not leave R.O.B. helpless afterwards. However, the move has a limited amount of fuel, which only recharges while R.O.B. is on the ground. In Super Smash Bros. Ultimate, the three lights that make up a gauge on his chassis indicate how much fuel he has left (three blue lights when it is full, two yellow lights when it is two-thirds full, and one red light when it is one-third full). When it is empty, the lights flash red until it is full again. 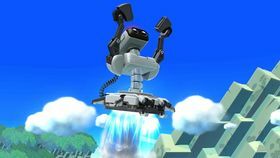 In Super Smash Bros. for Nintendo 3DS / Wii U, the Robo Burner's first custom variant is Robo Rocket, which turns the move into a jump rather than flight that cannot go as high and leaves R.O.B. helpless afterwards, but can damage opponents. The second is High-Speed Burner, which allows R.O.B. to fly faster but has less total fuel. Gyro is R.O.B. 's down special move, based on the gyro accessories that the actual R.O.B. uses to play Gyromite. R.O.B. charges the attack by spinning the gyro in place on a stand, similar to how he uses an actual gyro; the charge can be stopped by using another button. Pressing the button again causes him to toss the gyro, the distance and power determined by how long it charged. After R.O.B. tosses the gyro and it lands on the ground, it spins in place for a time until it disappears; while it is active, opponents who run into the gyro receive damage as long as it is spinning. R.O.B. can pick up the active gyro, while opponents can catch it while it is in the air. In Super Smash Bros. for Nintendo 3DS / Wii U, the Gyro's first custom variant is Fire Gyro, which tosses a flaming gyro that deals more damage but does not travel as far. The second is Slip Gyro, which tosses a gyro that spins across the ground and trips any opponents that are hit by it. Diffusion Beam is R.O.B. 's Final Smash in Super Smash Bros. Brawl. R.O.B. shoots a constant beam from his eyes for the duration of the move that deals continuous damage to any nearby opponents and will occasionally shoot a blast of energy. R.O.B. is able to move freely, is invincible to damage and unaffected by knockback, and can use any of his other moves while this move is in use. Super Diffusion Beam is R.O.B. 's Final Smash in Super Smash Bros. for Nintendo 3DS / Wii U, replacing the original Diffusion Beam from Super Smash Bros. Brawl. R.O.B. transforms himself into a cannon and fires a laser that splits off and ends in four smaller branches. Opponents caught in the beam are trapped and take repeated damage. Once the beam dissipates, the opponents are stunned for a brief moment and R.O.B. fires a second beam that launches them away. The angle of the first beam can be adjusted with the control stick, but the second beam always fires directly ahead of R.O.B. 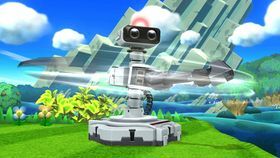 Guided Robo Beam is R.O.B's Final Smash in Super Smash Bros. Ultimate, replacing the Super Diffusion Beam from Super Smash Bros. for Nintendo 3DS / Wii U. 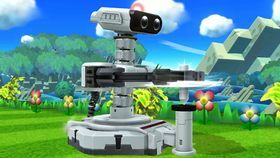 Similar to the previous Final Smash, R.O.B transforms himself into a cannon and starts firing multiple small lasers that home in on opponents, before firing a green laser beam that grows in size after a few moments before ending with a powerful blast. The laser can be angled either up or down. R.O.B. also makes an appearance as a Mystery Mushroom costume in Super Mario Maker. His appearance changes depending on the region: in the Japanese version of the game, his appearance matches that of the Famicom; in all other versions, it matches that of the NES. Upon transforming into R.O.B., the "level start" tune from Gyromite plays. When is pressed, R.O.B. emits beams of light from his eyes. Website Bio ( ): "Robotic Operating Buddy, to give R.O.B. his full name, has come out of retirement to take up a new career as a Mario Kart driver - and a strong one at that. 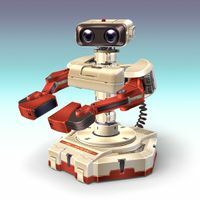 But you'll be lucky if you catch sight of him, as he's notoriously elusive..."
"R.O.B., the Robotic Operating Buddy from the NES, makes a grand entrance into the maelstrom! His stately form has received a lot of attention, but it’s his air of gentle playfulness that really charms us." R.O.B. NES Nintendo Entertainment System Robotic Operating Buddy R.O.B. sporting his Famicom colors. R.O.B. debuted in Japan as Robot in 1985 as an add-on for the Famicom. He could be combined with a "gyro set," etc. for two types of play. The player controlled Professor Hector, the TV emitted light, and R.O.B. responded to the light by moving. At the time, it was epoch- making game play. Recently, R.O.B. appeared in Mario Kart DS. Diffusion Beam Wii Super Smash Bros. Brawl R.O.B. 's Final Smash. He emits a beam from his eyes that spreads across the spectrum and undulates in great variety as it travels. What makes this technique different is R.O.B. 's ability to move while using it. This allows him to use it in combination with his other moves to increase his Final Smash's effectiveness. Wii Super Smash Bros. Brawl The commander of the Subspace Army who uses Subspace Bombs to tear up this world. He was once the lord of this world, living on the floating Island of the Ancients with many robots--but the robots were taken hostage on Tabuu's orders. Now that their home's a bomb factory, the robots carry out their functions while enduring deep sadness caused by the loss of their colleagues. Otacon: So, Snake, you're fighting Robot? Snake: Yeah, it's a robot. Although, couldn't they have come up with a better name? Otacon: Actually, in the U.S. they called him "R.O.B." Robot, R.O.B.--take your pick. Snake: Fine. R.O.B. it is, then. Otacon: In North America, R.O.B. 's body was grey, like the NES. But in Japan, he had a white body and red arms, the color of the Japanese Famicom. Snake: Huh. You sure know your geeky tech stuff, Otacon. DS Mario Kart DS (11/2005) This NES accessory was released in 1985, a groundbreaking system that controlled the robot via a game on the screen. In Smash Bros., R.O.B. has two projectile weapons and can use his rocket base to fly through the air. If you let his Robo Beam charge over time, it'll make for a powerful blast. 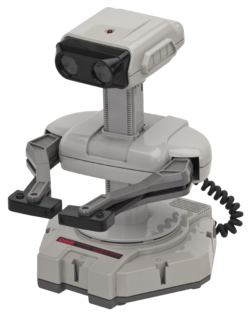 Originally released in 1985 as a peripheral for the NES, R.O.B. was a little robot that responded to flashing lights in games. In this game, he can fire gyros and lasers at his enemies. He also has the ability to hover, which is handy for recoveries. Keep in mind that his Robo Beam can be charged up for an extra-powerful shot. DS Mario Kart DS (11/2005) R.O.B. 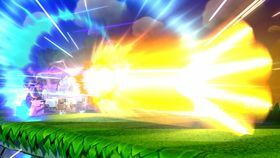 's side smash, S3, fires a laser beam that does more damage up close. You can also aim it slightly up or down before firing. His down special Gyro sends a spinning top hurtling forward and can be charged for more damage. You can even dodge while charging! R.O.B. 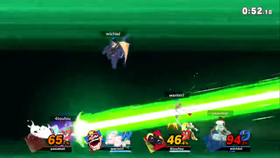 's side smash, S3, fires a laser beam that does more damage up close. You can also aim it slightly up or down before firing. His down special Gyro sends a spinning top hurtling forwards. While charging it up, you can move left or right to do a quick dodge, then continue charging where you left off! N/A For R.O.B. 's Final Smash, he folds his arms down, transforms into an invincible cannon, and fires a huge beam that can be panned slowly up and down. The beam splits up partway through into smaller beams that drags foes to the center, where they'll be hit continuously. The assault finishes off with a single wide beam just for good measure. For R.O.B. 's Final Smash, he folds his arms down, transforms into an invincible cannon, and fires a huge beam that can be aimed slowly up and down. The beam splits up partway through into smaller beams that drag foes to the centre, where they'll be hit continuously. The assault finishes off with a single wide beam, just for good measure. Palutena: Look at that cute little robot! Pit: R.O.B. isn't a very creative name for a robot. Palutena: I think it has a certain ring to it. Pit: No way! Any name is better than R.O.B.! Like, hmm... How about Mr. HVC-012? Pit: How about Robobuddy, Third Edition? Palutena: And what happened to the first two editions? Pit: Oh, good point. How about Zzzrt...Blaaat...Tron? Palutena: Let's just keep things simple by calling him R.O.B. Viridi: The light on its head shows you the strength of the laser it's about to fire. The moment you forget about it, it'll unleash its laser at maximum power, so watch out! R.O.B. has been voiced by Toru Asakawa in Mario Kart DS. In other games (notably the Super Smash Bros. series), he uses computer-generated sound effects instead. "HVC-012" is the product ID of the robot. In the same style as the original R.O.B., R.O.B. 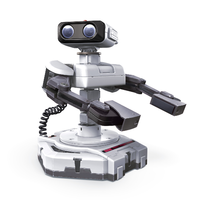 's amiibo's coloring differs depending on the region; however, R.O.B. 's Famicom coloring would later be available around the world and the NES coloring also being released in Japan. If both are used in Yoshi's Woolly World and Poochy & Yoshi's Woolly World, the player can get two different R.O.B. Yoshis. Curiously, the same cannot be done in Super Mario Maker. In the Nintendo 3DS game Tomodachi Life, R.O.B. 's description references its appearance in the Super Smash Bros. series, referring to it as an "official Smash brawler." ↑ 1.0 1.1 April 10, 2008. Mysteries of The Subspace Emissary. Smash Bros. DOJO!!. Retrieved June 29, 2018. ↑ (March 6, 2008). R.O.B.. Smash Bros. DOJO!!. Retrieved July 3, 2018. This page was last edited on April 16, 2019, at 16:49.